Join Candace each month to learn tips and techniques for using your serger to make basic knit garments. We will select a different garment each month and utilize time-saving techniques to make serging easy and fun. This class is designed for the beginning student but everyone is welcome to join in this fun social serging class. 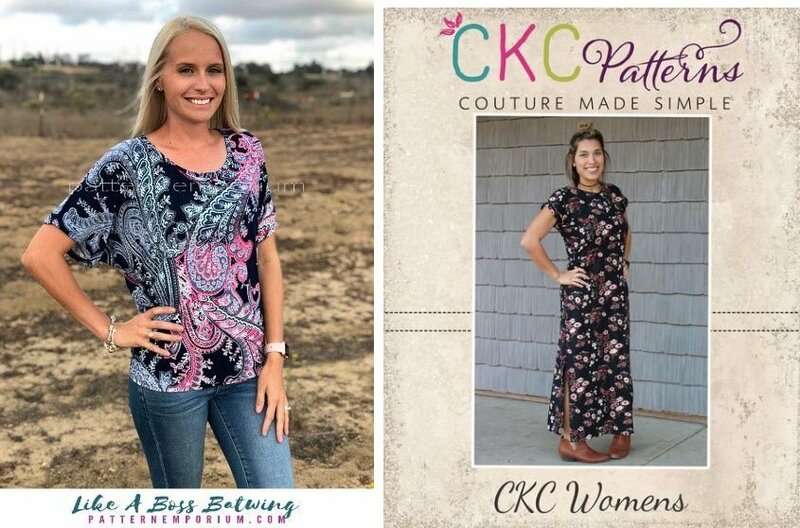 In March, you will choose between the "Like A Boss Batwing Top" from Pattern Emporium or the Dana's Dolman Top/Dress from CKC Patterns. Both tops are cut as a dolman sleeve making them quick and easy to sew The Batwing top has a fitted hip and different neckline options. The Dana has optional cuffed or un-cuffed sleeve versions and 3 lengths to choose from. These tops will be the perfect start for your spring wardrobe. Fabric suggestions include most all knits with 4-way stretch. Viscose or rayon polyester blends, modal bamboo, double brushed polyester, merino wool knit, stretch velvet (velour), polyester jersey, stretch crepe, and blends of the above. This is an Australian company so be sure to set the price option to USD for U.S. Dollars. Pattern printed and taped together. There will be no time in class to do this. 4 spools of serger thread* to complement your fabric choice. Threads do not have to be the same colors but should complement your fabric. Cover Stitch Machine with 2 spools of serger thread* that complement fabric for hemming bottom of sleeves. Sewing notions for cutting, marking, and pinning fabric. Clover Clips* recommended instead of pins. Double eye needle, tweezers*, scissors*, fabric glue*. Pattern weights helpful for cutting out fabric. SewKeys E double sided fusible tape 1/2" (green package)* to fuse hems in place before serging. Fabric: see pattern for yardage.